One of the most important questions I’ve ever asked was, “What would happen if every Dell team member had a robust profile on LinkedIn?” Out of that question, an idea was born. It was July of 2011. I was new in my role as head of Talent Acquisition for North and Latin America. My personal profile on LinkedIn was pretty sparse. I didn’t have a Twitter account and wasn’t very active on internal social media. I knew I needed to learn more about the role of social media and recruiting. Through Dell’s SMaC (Social Media and Communities) University, I learned how I could support the company’s brand on social media and community platforms. Once SMaC certified, I wanted to find a way for Talent Acquisition to activate the Dell team member network to build our employment brand. In November, I had my first meeting with LinkedIn. During this meeting, we reviewed key indicators for employment brand strength. 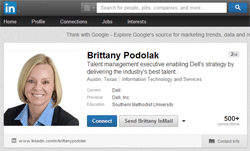 At the time, approximately 70 percent of Dell team members were on LinkedIn with 265,000 followers of our career page. These numbers weren’t terrible, but I still wanted badly to find a way to increase participation and grow our following. Together, we came up with the idea to engage Dell team members about the value of personal brand and to offer hands-on coaching to build (or “primp”) their profile on LinkedIn. Our annual sales gathering and planning session in early 2012 was just around the corner and we thought it would be the perfect forum for piloting our idea. In partnership with SMaC U, we developed the content for a leadership training called “Hire the Best” and set up a room complete with “primping” stations and a photographer. The pilot was a huge success – each of the seven classes were full and the “Primp your Profile” area was standing room only from 8 to 5 during all three days of our team sales event. Since then, we have delivered hundreds of “Hire the Best” sessions and helped “primp” countless LinkedIn profiles around the world. Dell participation on LinkedIn is now well over 90 percent with over 725,000 followers. We know that the best talent may not be actively looking for new roles, but can be compelled to consider Dell as employer of choice if presented the opportunity to work on a team known for delivering superior customer value while demonstrating corporate and social responsibility. We will continue to focus on building our brand by encouraging team members to act as ambassadors for Dell in the external talent market. Great Initiative Brittany! Congratulations of this huge success.